We had the absolute pleasure of taking charge of the opulent floral concept for the recent Noosa wedding of Sarah and James. 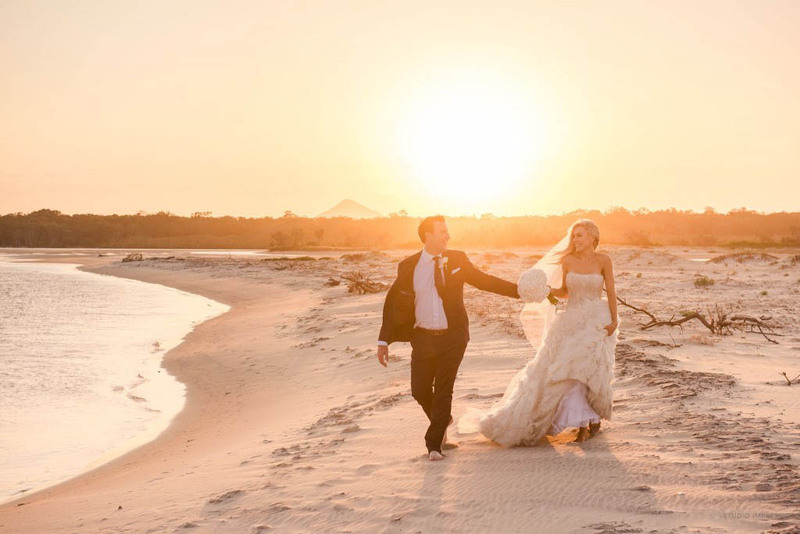 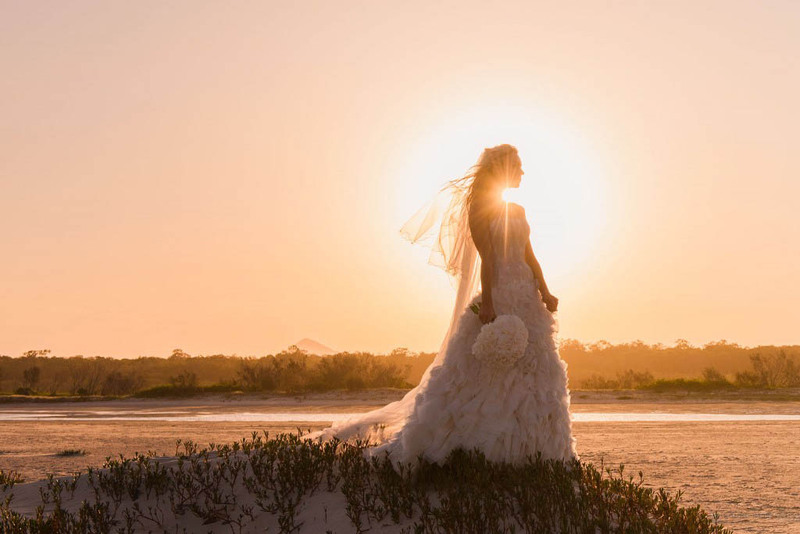 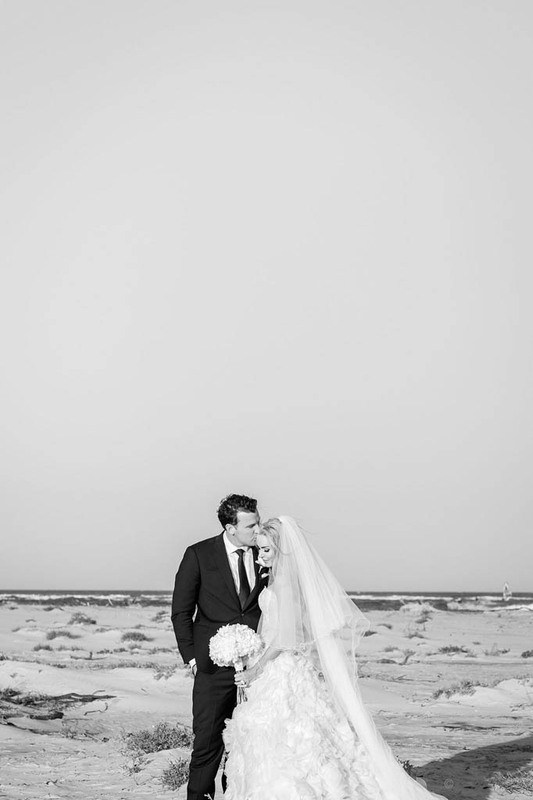 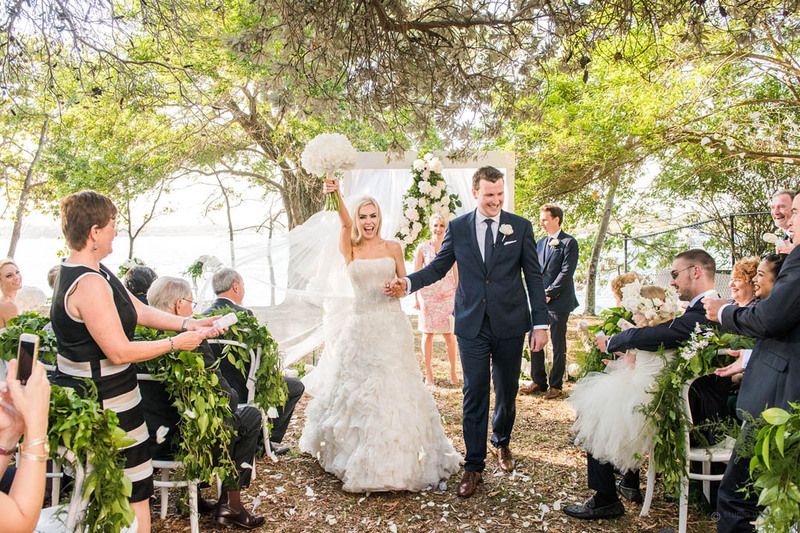 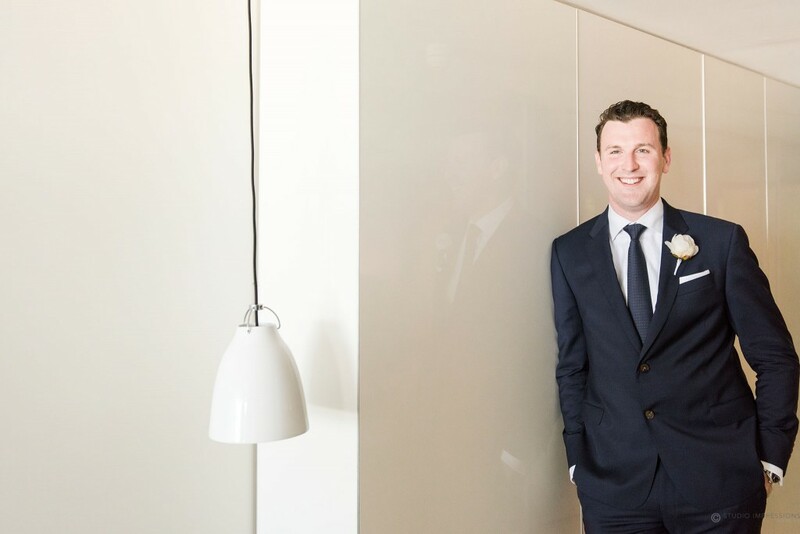 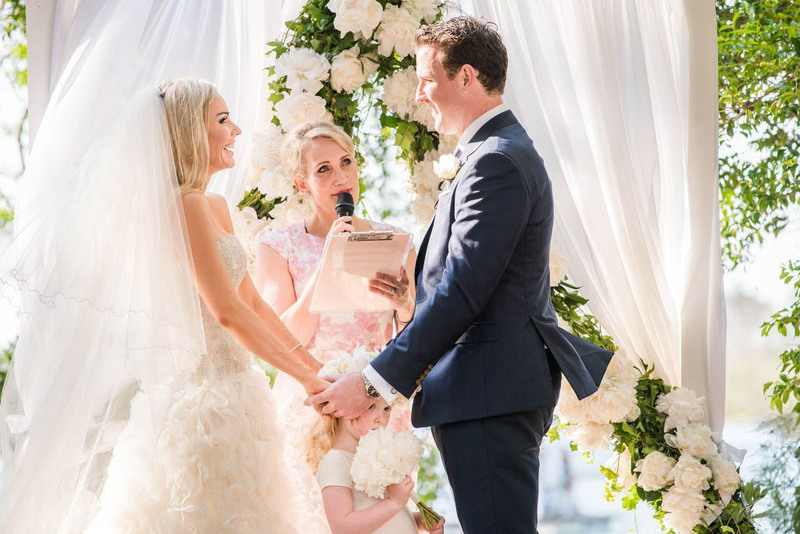 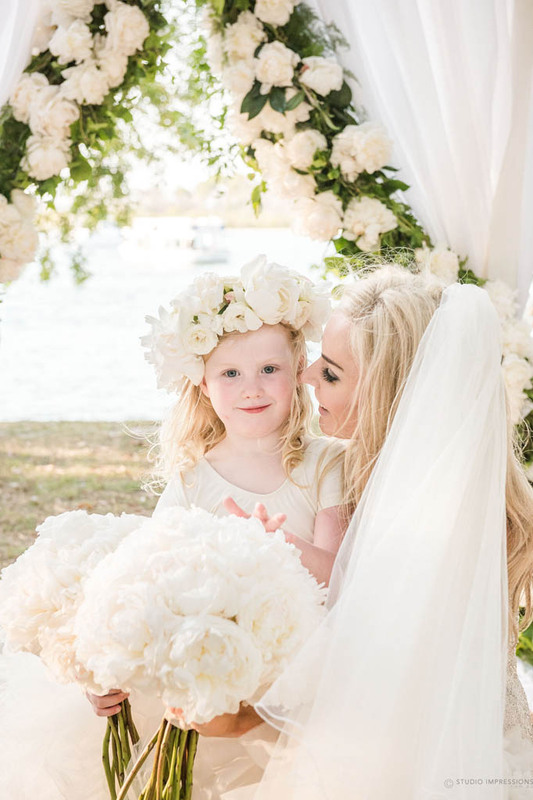 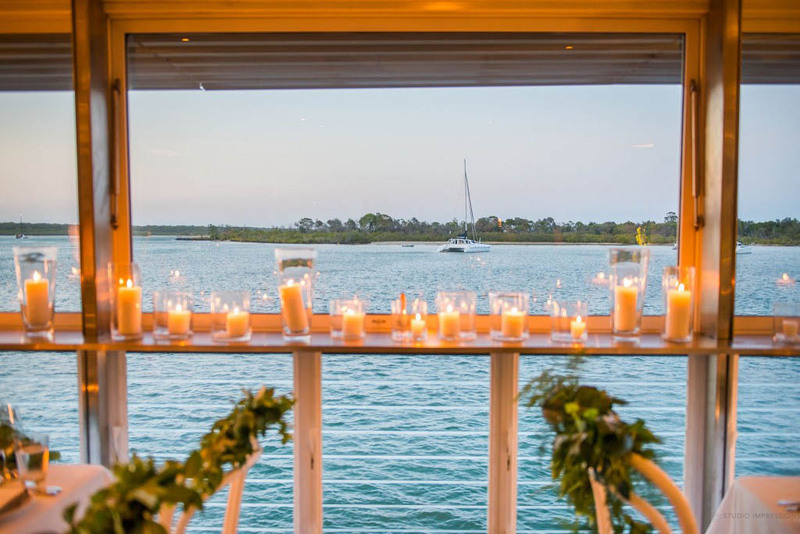 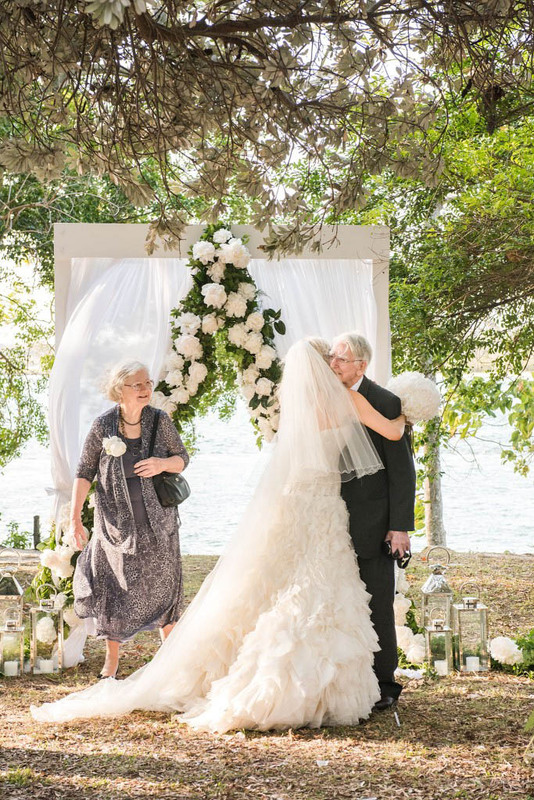 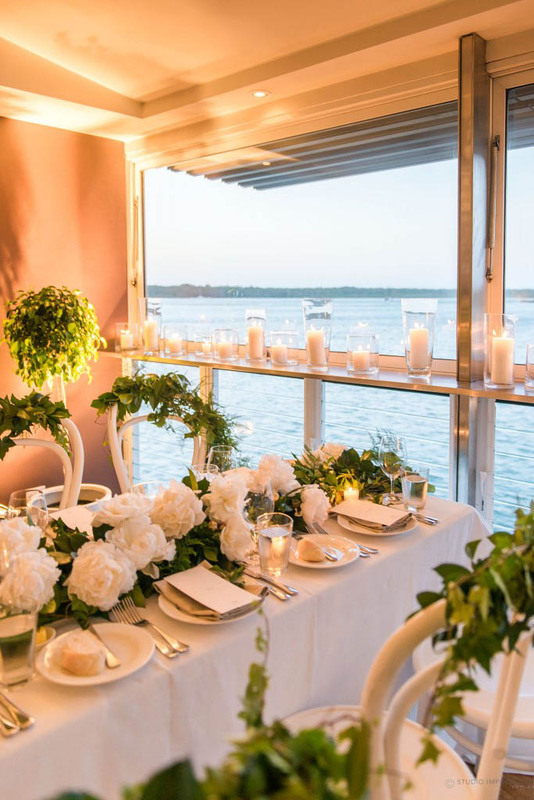 This gorgeous loved up couple set forth to make their wedding day truly memorable, with glamorous styling elements, a divine floral concept, and a sophisticated and chic celebration with family and friends, their Noosa wedding day was not only extraordinary it was certainly unforgettable. 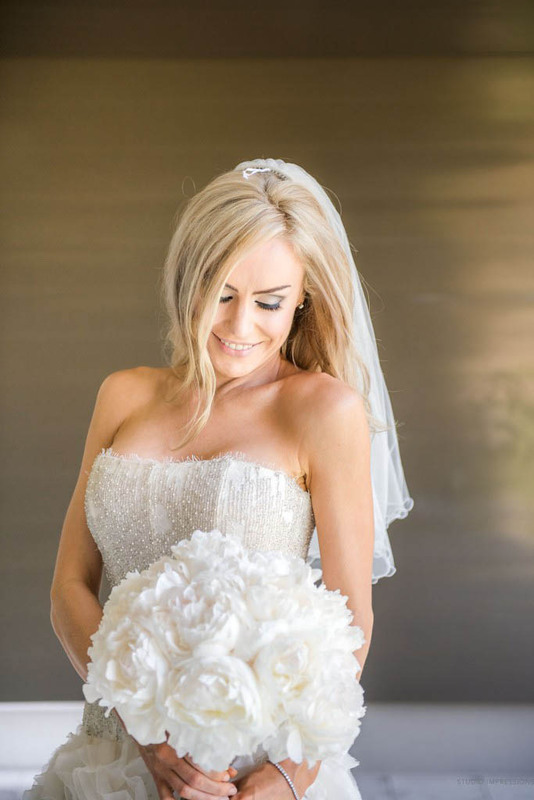 Each part of this impressive love story paints a picture of absolute perfection, from the incredible wedding gown that Sarah wore to the decadent tablescapes we created at the lavish reception, it was sophisticated style at it’s very finest. 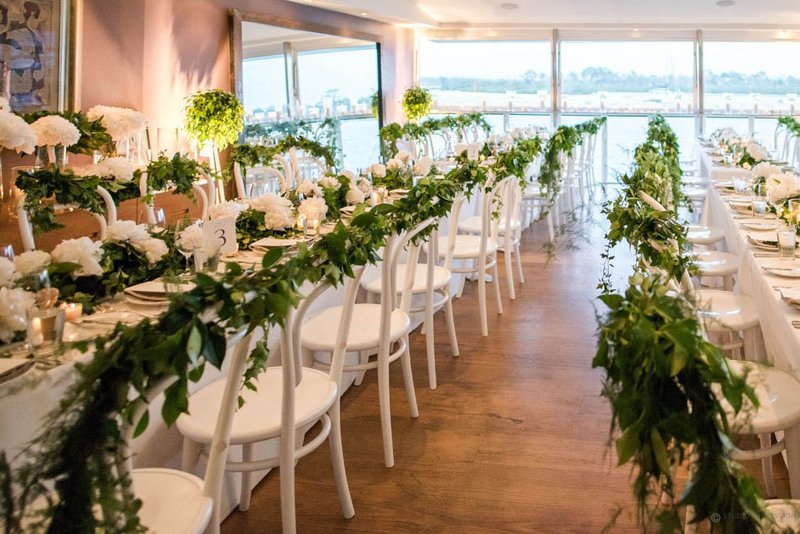 I knew that this wedding was always going to be memorable, the amazing suppliers that Sarah and James engaged to ensure the WOW factor was created for their wedding day, were some of the very best in the biz, it takes a large group of suppliers to make a day like this a success, and with so many talented creators on board it was always going to be a wonderful event. 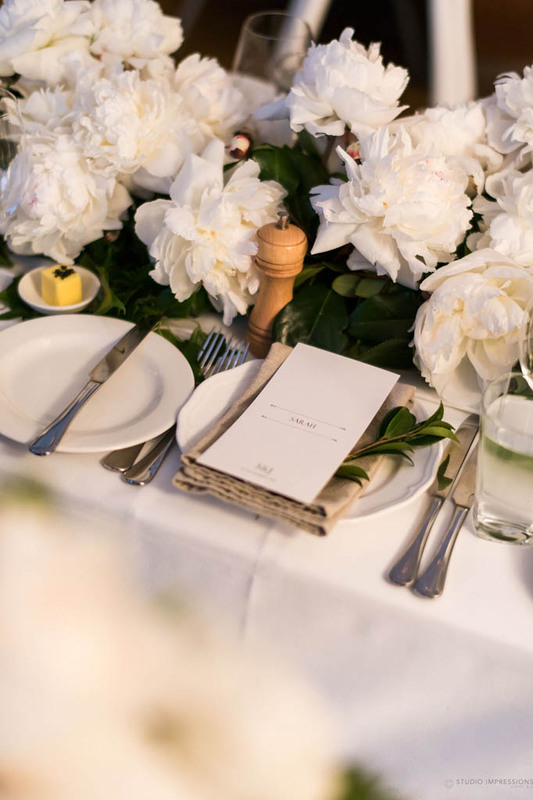 Photographed by Marcus Bell from Studio Impressions, we were certainly in wonderful company, and as Sarah and James shared with me their extensive flower brief that highlighted the importance of the styling and floral designs, I knew instantly that these creative components were an integral and essential part of their wedding day. 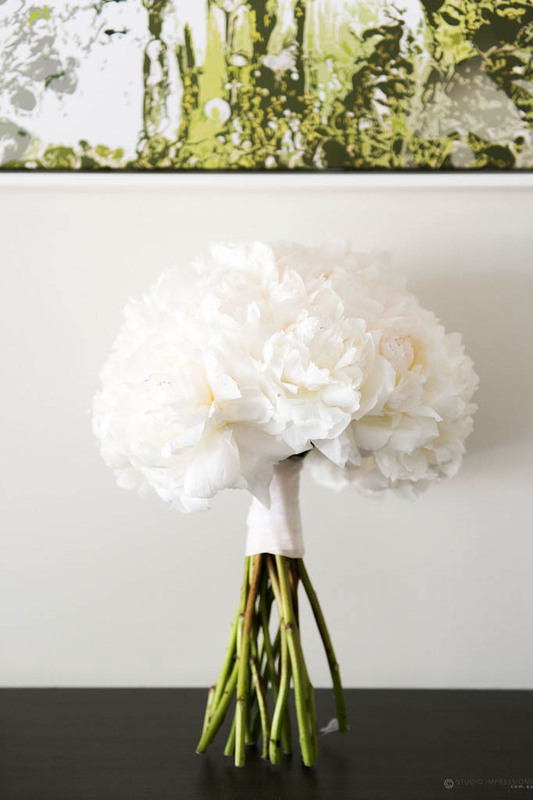 Sarah’s favourite flower was the beautiful peony, and flowering for only 5 weeks a year, the wedding day was planned immaculately in the right time frame to highlight these beautiful blooms, every single floral component showcased these glorious treasures, and the magnificent fluffy heads of the divine peony stole the styling show, featuring over 1000 heads of these decadent flowers, this exquisite floral concept was an exceptional display of absolute beauty. 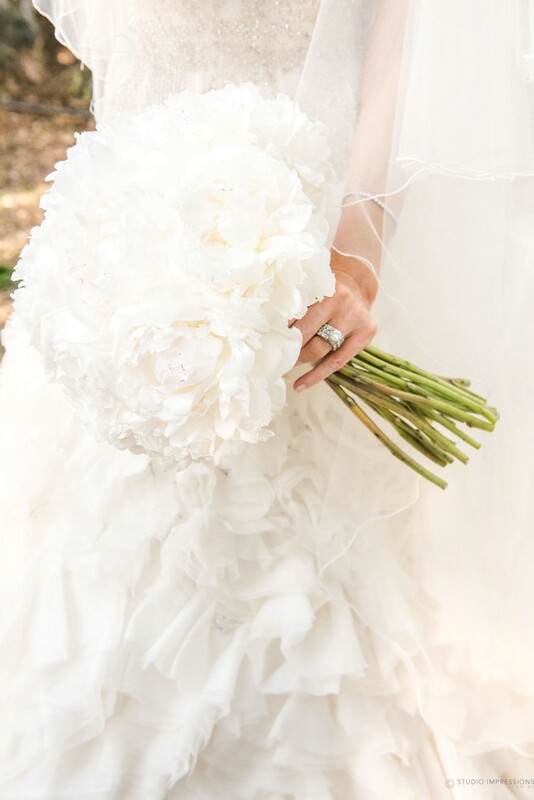 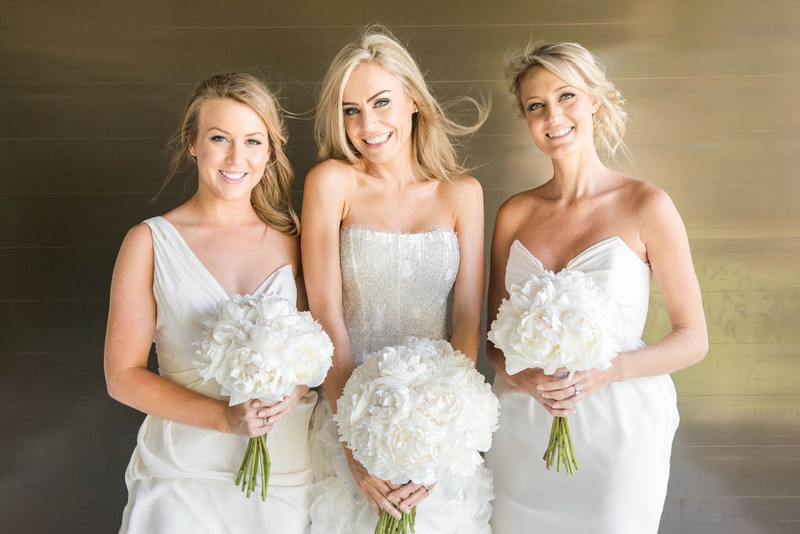 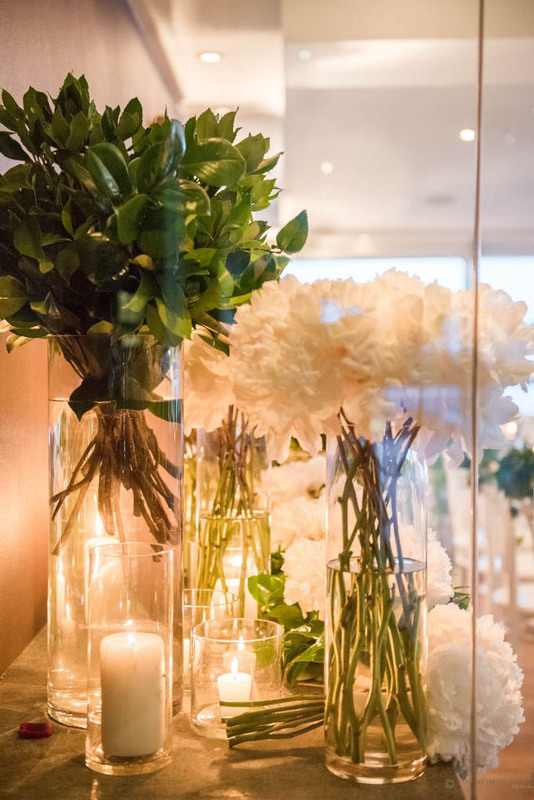 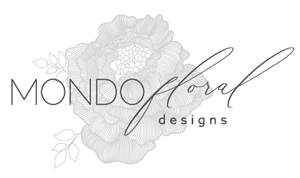 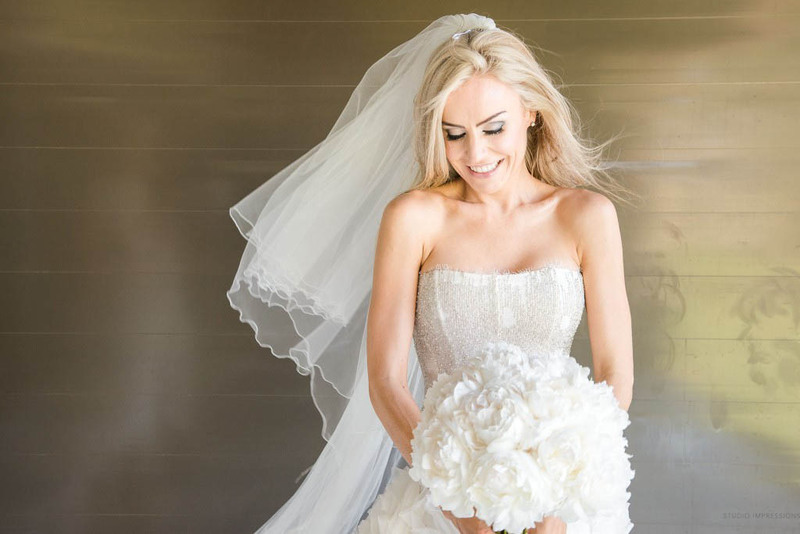 The wedding bouquets consisted of hand held bouquets of fluffy fabulous peonies, simple, sophisticated and opulent in design they were the perfect accent to the dresses and the start of this beautiful bloom story. 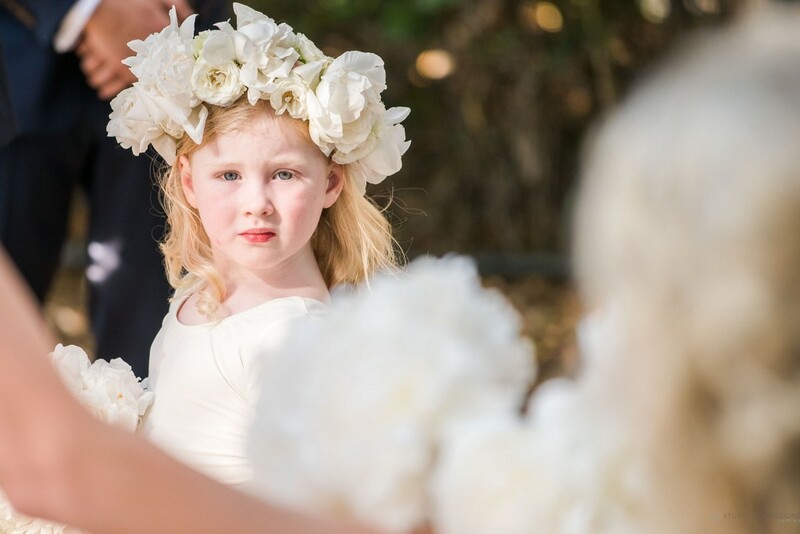 Sarah and James’ daughter Hannah also wore a pretty flower crown and carried a petite posy of peonies. 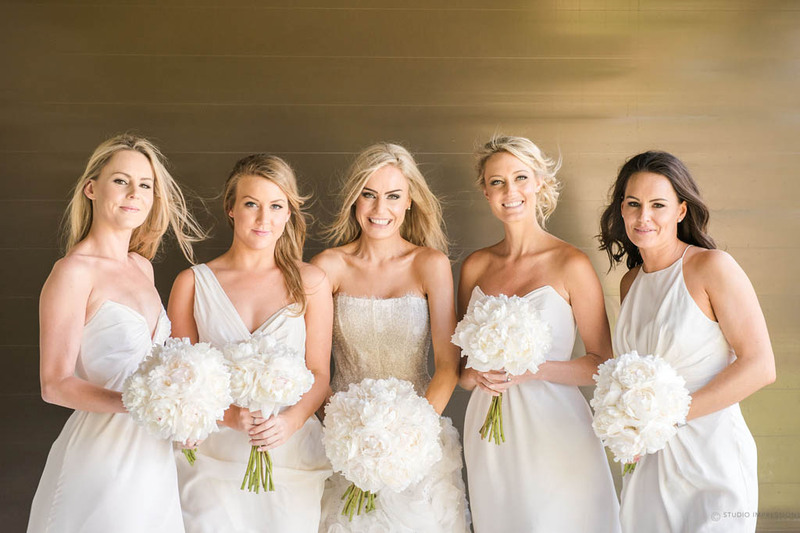 The glamorous and gorgeous bridal party were a vision in white and ivory, the bridesmaids wearing eclectic Zimmerman dresses simple yet chic designs, that highlighted the white on white styling of the beautiful day. 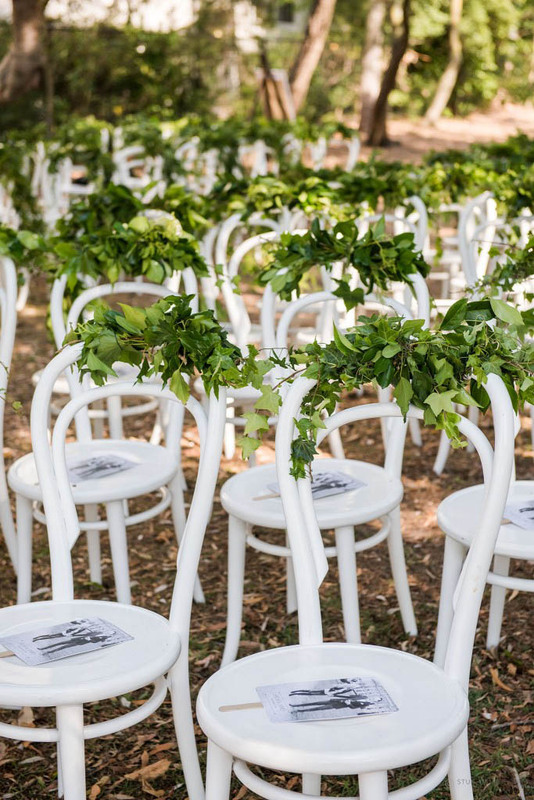 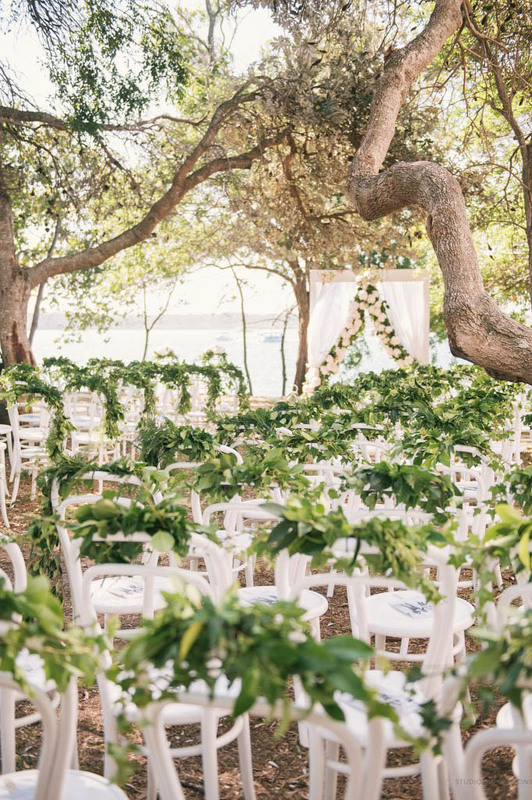 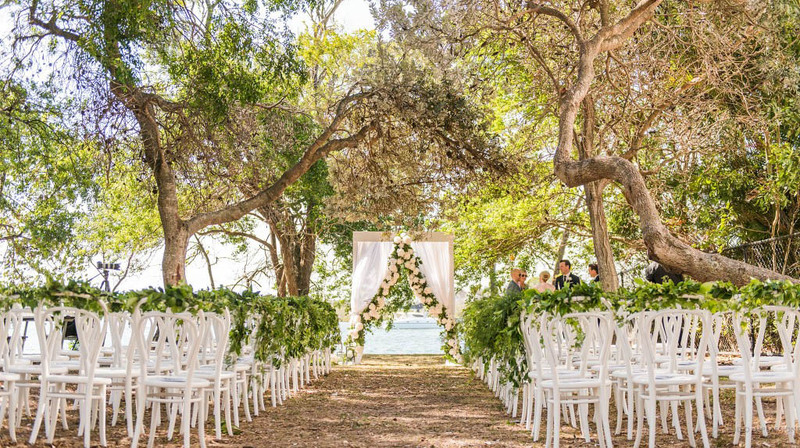 The ceremony was held by the Noosa River, amongst a canopy of trees and by the glistening water an absolute picture of styling was captured featuring over 100 Bentwood chairs provided by Epic Empire , these white delights were draped with greenery garlands and the most opulent canopy adorned with peonies and a lush greenery garland took centre stage. 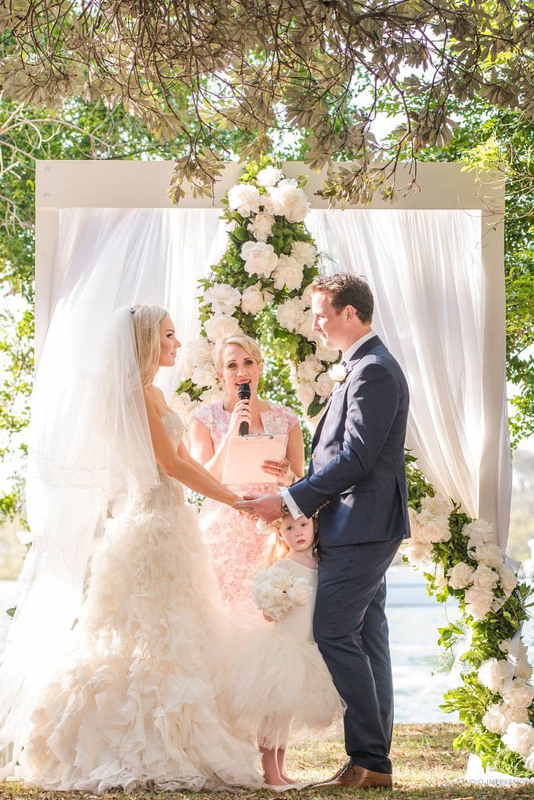 We worked closely with CL Weddings and Events to ensure this incredible ceremony space was the perfect start to this styled up celebration. 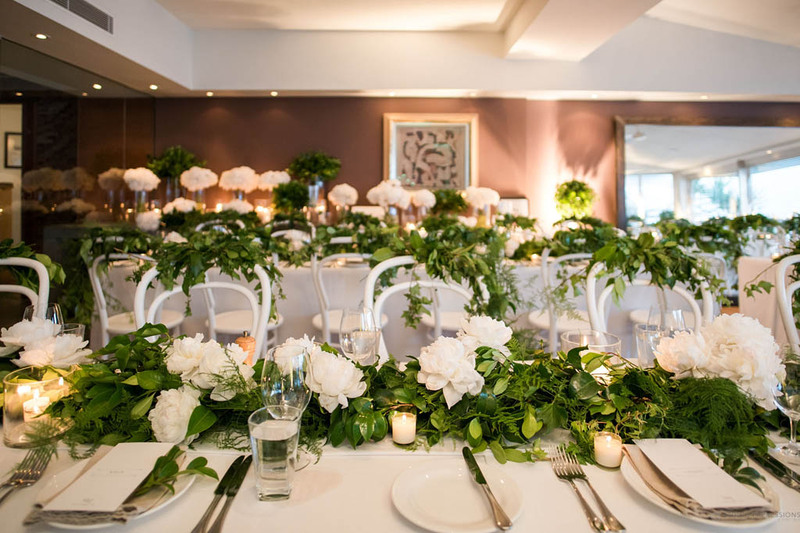 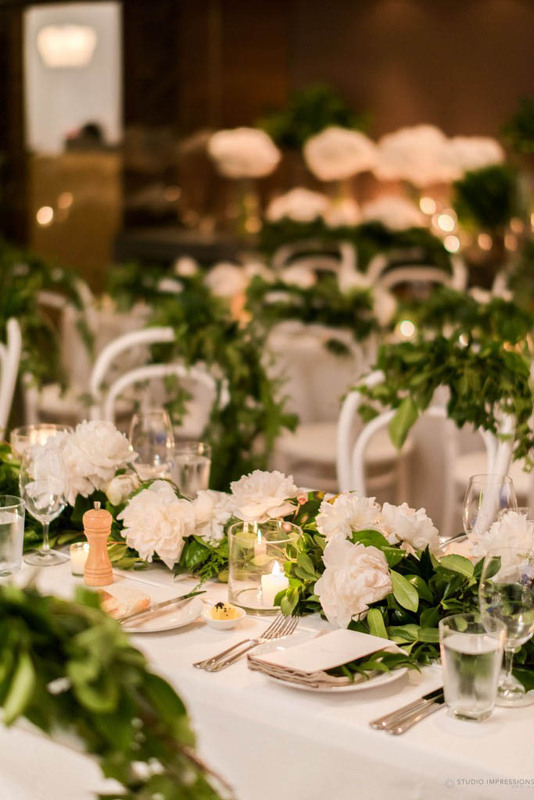 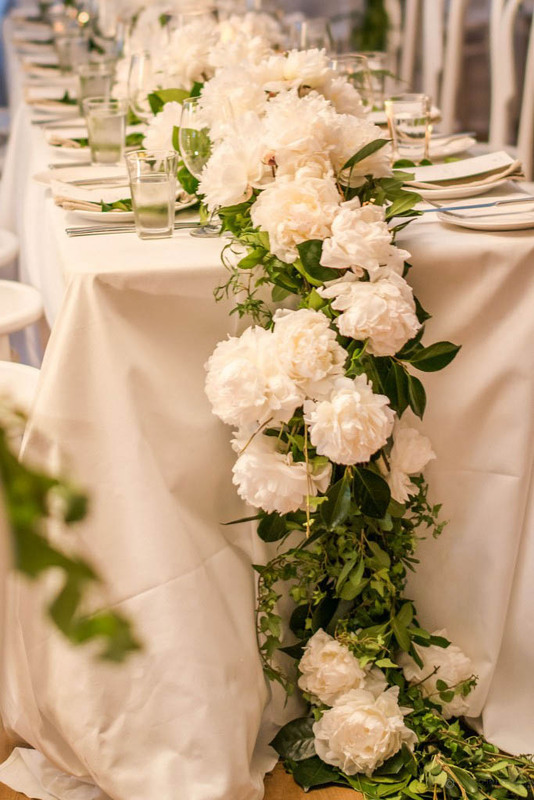 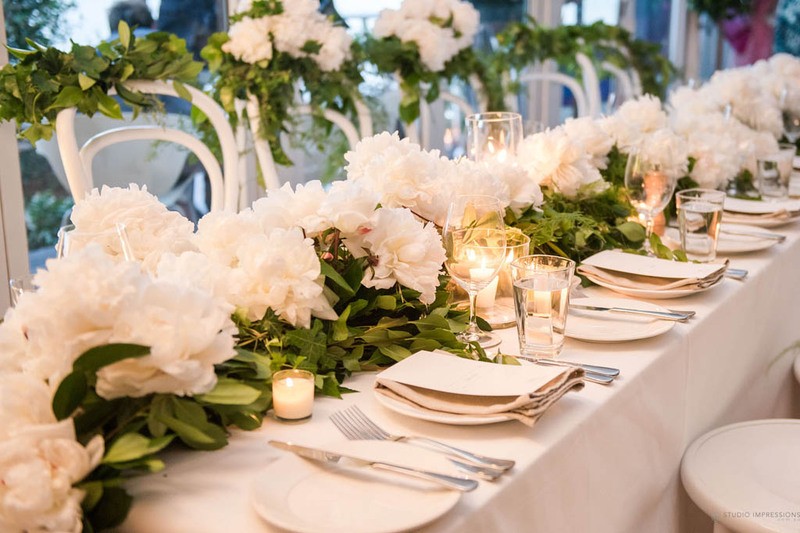 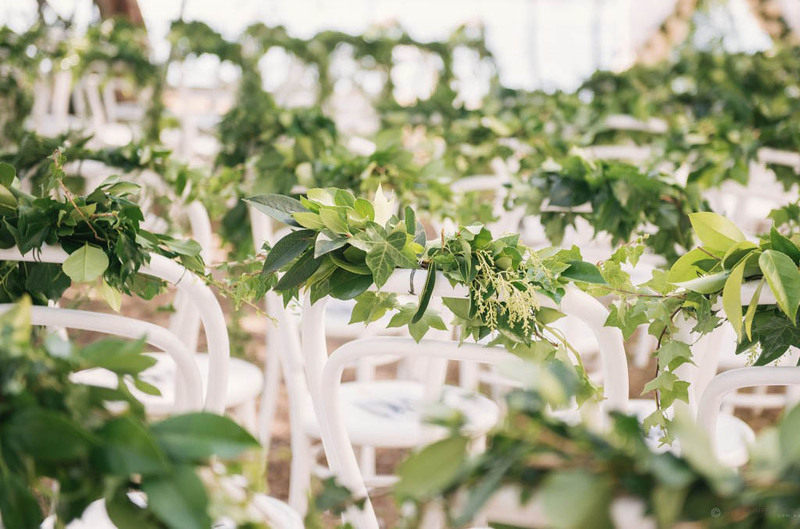 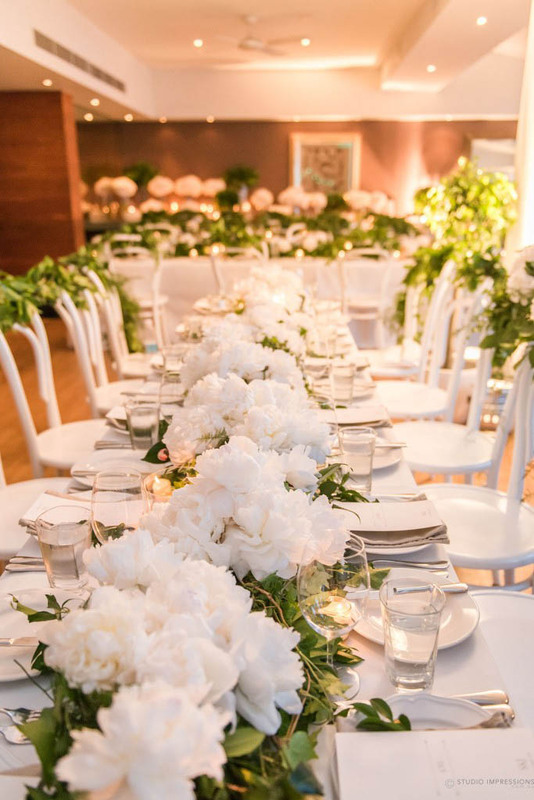 The reception at Rickys Noosa featured lush greenery garlands of camellia, gardenia and ivy berry foliage’s, and on each garland was a mass of peony blooms, fluffy white and delicious these little delights sat perfectly amongst the gardenesque greenery features. 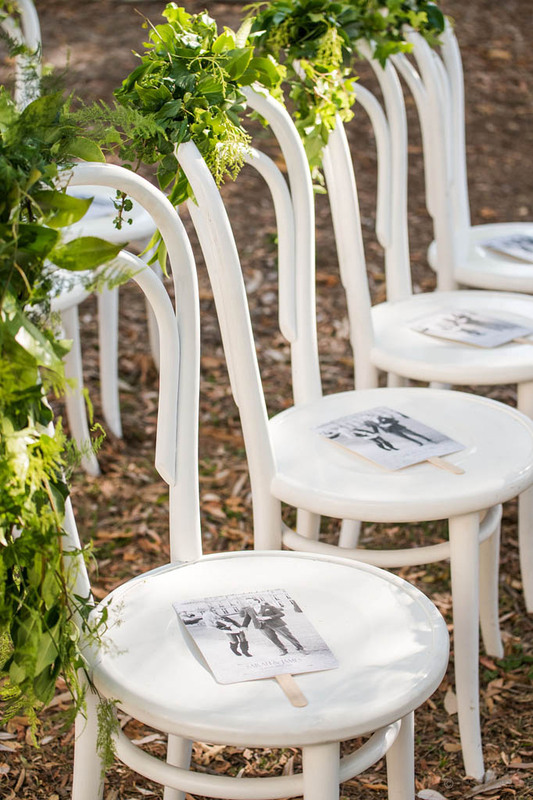 The chairs from the ceremony were featured within the reception once again and were the perfect finish to the garden glamour. 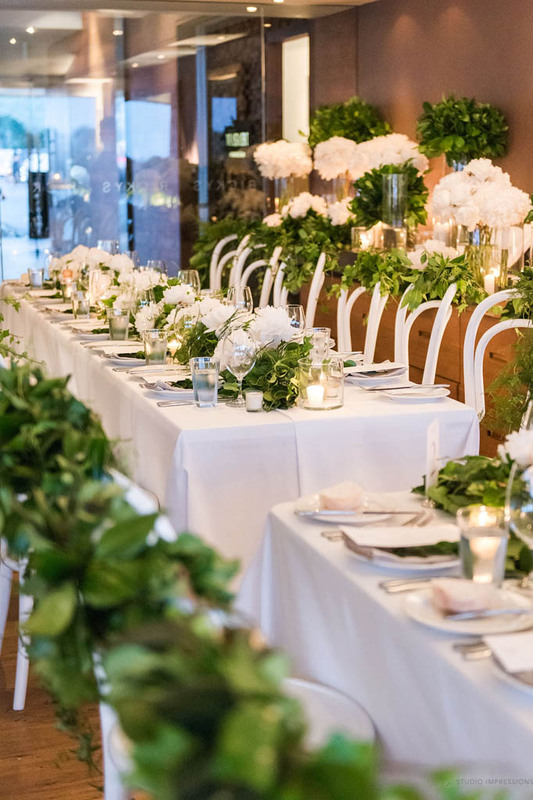 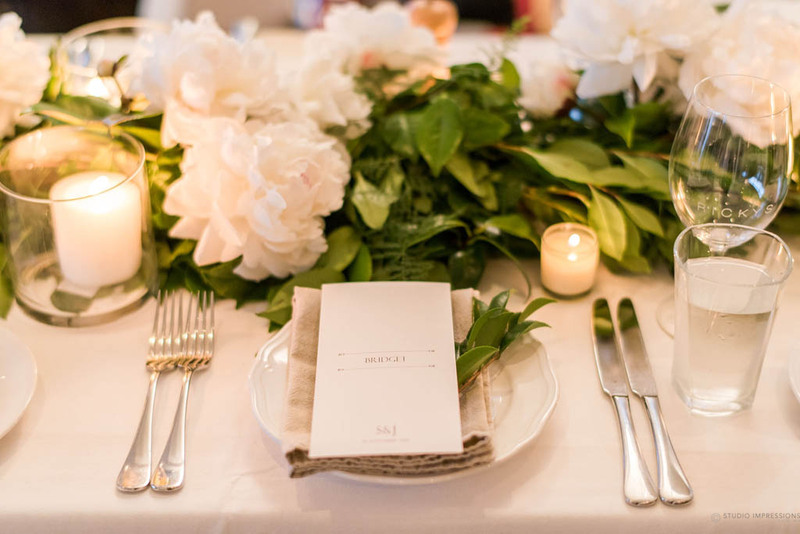 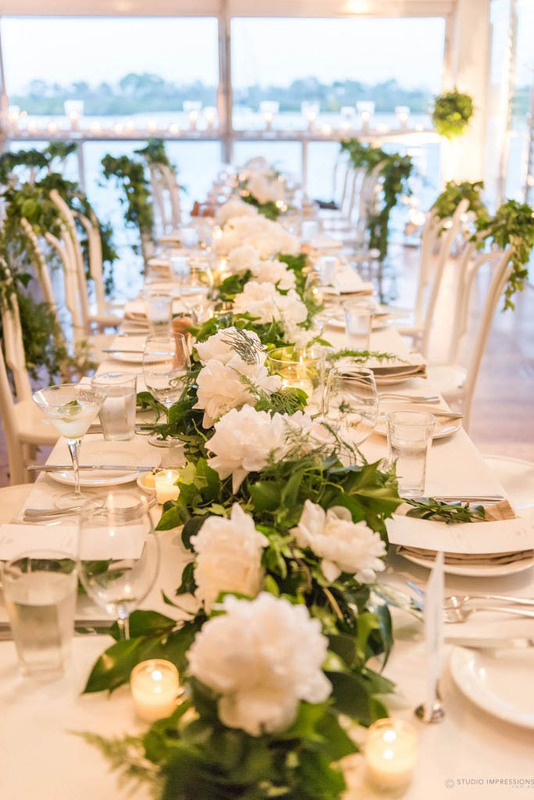 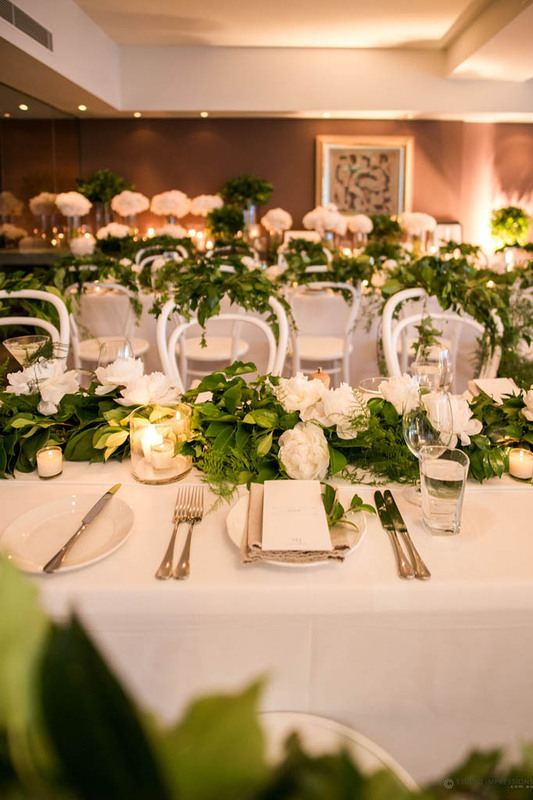 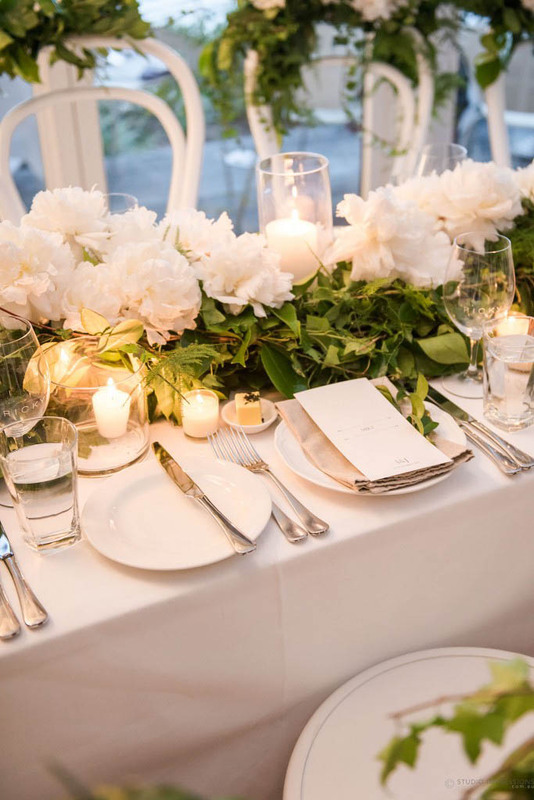 Each table also featured crisp linen and a mass of candles also provided by CL Weddings and Events, and many more featured on the window features around the restaurant, and we placed a sprig of sweet green on each beautiful plate, to put that final touch of texture on the table. 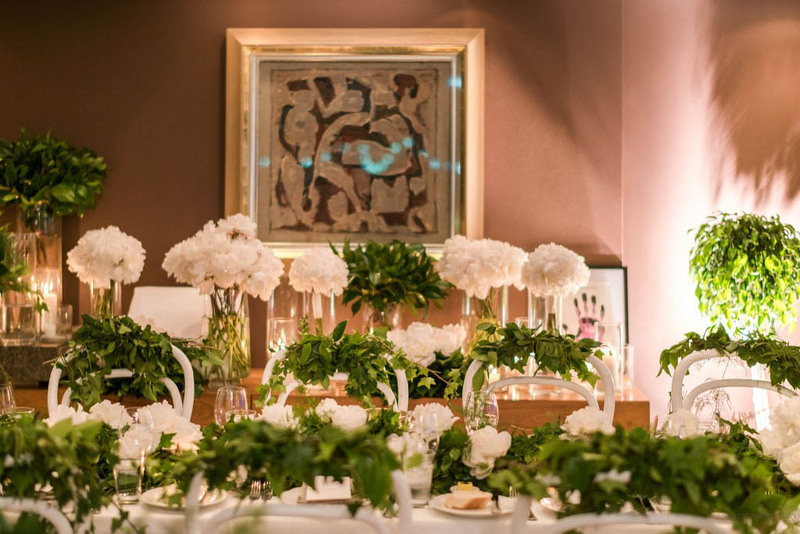 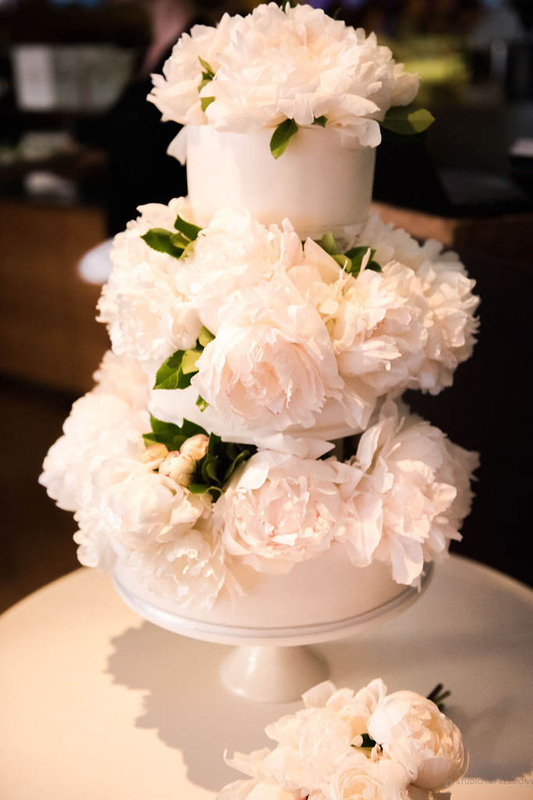 The incredible cake was created by Cake Designs, and we loved filling the tier spaces with more pretty peonies, to the corners of the room the buffet area of the beautiful restaurant was filled with vases of more peonies and gorgeous greenery features. 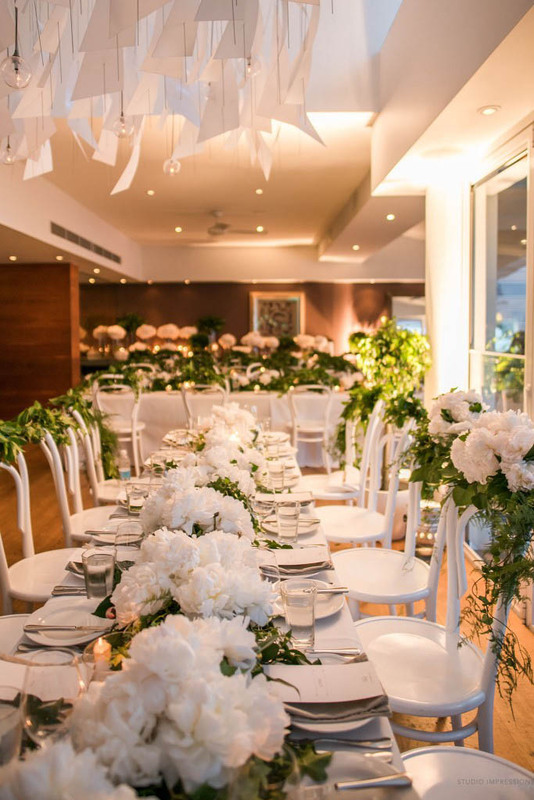 All in all this event was an incredible display of divine decadence and gave us the opportunity to play with one of our favourites blooms, it was a delight to be involved in this very special day and we adored creating this white glamour inspired floral concept for Sarah and James on their Ricky’s Noosa wedding Day!